This home has exquisite architectural details both inside & out. From the floor-to-ceiling windows in the main living room, you get a wonderful vantage point of the cerulean waters of Sarasota Bay as well as the Ringling Bridge beyond. This 2-story steel fireplace is simply eye-catching and features a concrete hearth and a gas flame. The large cook’s kitchen includes Wolf/SubZero appliances including two 36” side-by-side fully-integrated refrigerator/freezers, double ovens, gas range, stainless steel range hood, island with solid walnut butcher block top & attached marble farm table. 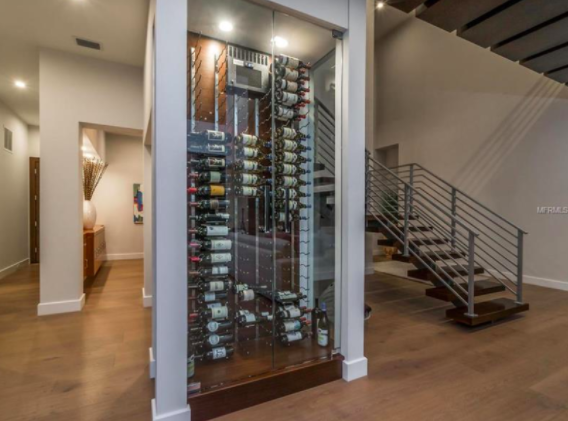 There is also wine storage for 225 bottle rights off the kitchen & living room! The contemporary 10-inch plank Italian smoked oak wood floors and mahogany ceiling give the open space a contemporary feel. The outdoor living space includes a fireplace, stone floors, brick feature fall, and Alfresco grill system for all your outdoor entertaining possibilities, whether that’s gathering friends together for a boat ride — The wonderful location of this home allows for deep-water dockage with two dock lifts that accommodate vessels up to 17,000 & 10,000 lbs — OR whether you just want to have friends and family over to the heated waterfront pool & spa, which overlooks the manicured lawn and the sparkling bay. The great west-of-trail location was perfect for my buyers, who wanted to be close to downtown and yet feel like they were in their own private oasis. I’m glad to say we found the perfect place! Please give me a call today if I can help you find your perfect Sarasota-area home!